By the time that Charles Willson Peale painted the Staircase Group, he had abandoned commercial portraiture to devote himself to natural science and to his museum and zoo at Philosophical Hall. To help foster the arts in Philadelphia, however, he was instrumental in founding the Columbianum, an artists' association modeled on the Royal Academy in London. For its first and only exhibition, Peale executed this painting to demonstrate that he remained one of the city's preeminent artists. On an unusually large canvas, he made one of his rare full-length portraits, showing two of his sons on an enclosed spiral staircase. Its high degree of detail and finish shows that the painting was clearly intended to be a trompe l'oeil "deception," an effect that Peale never attempted elsewhere. 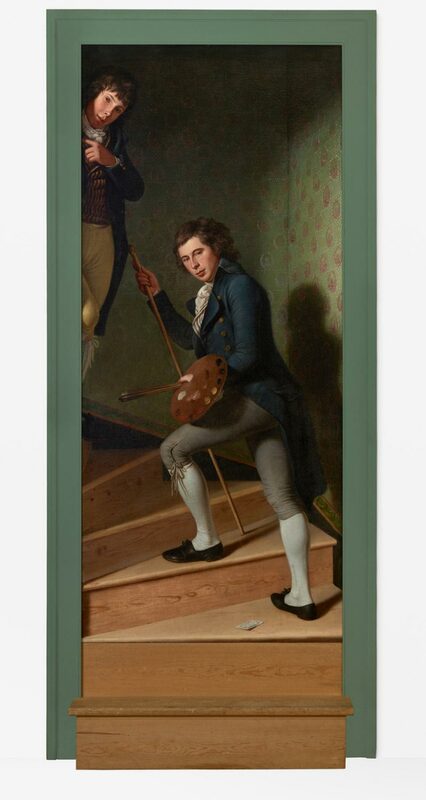 To enhance the illusion, he installed the painting within a doorframe in his studio, with a real step in front. Rembrandt Peale, another son, recalled that his father's friend George Washington, misled by Peale's artifice, tipped his hat and greeted the two young men as he walked by. Darrel Sewell, from Philadelphia Museum of Art: Handbook of the Collections (1995), p. 267.